At the heart of all tragedy, the Greeks saw a phenomenon they called hamartia: a fatal error born of unavoidable ignorance. Combined with a fundamental moral flaw, hamartia inevitably led on to destruction. For the Greeks, humans were cursed not just with mortality of the flesh, but also hamartia-driven mortality of the spirit. Hamartia was the Gods being Divine Jerks, randomly toying with human lives for their own pleasure, through cat-and-mouse games the latter could not hope to win. For the Greeks, any divine purpose, even subtly malicious randomness, in the ordering of the universe, was preferable to purposelessness. At least the gods cared enough to be cruel. The Clueless disdainfully ignore the reams of fine print, and proudly check: death. After trying, and failing to understand the fine print, the Losers cautiously check: booga booga. Welcome to the penultimate episode of the Gervais Principle series. The saga of two-plus years and 20,000-plus words of booga-booga that you have already endured is now winding its way to a tortuous conclusion. We will return to the grave matter of metaphysical booga-booga in the final part. Let us start the last leg of our journey in a familiar place: Dunder-Mifflin. With that solemn declaration of Samurai honor, Dwight offers himself up as scapegoat to the panicked Michael. This is a simple and child-like example of the operation of a basic human instinct: the heads-I-win-tails-you-lose or HIWTYL (let’s pronounce that “hightail”) instinct. It is the tendency to grab more than your fair share of the rewards of success, and less than your fair share of the blame for failure. Michael’s HIWTYL instincts do not play out in particularly effective or robust ways, as we saw when we examined this example earlier. When the situation serendipitously turns around, and the Golden Ticket scheme turns into an unexpected business coup, Michael attempts to take back the blame-turned-credit. Dwight resists, and in the resulting farcical fight over credit, David Wallace is actually the one who walks away with the win, without personally taking any risks, or rewarding the originator of the win. This outcome was no accident, as we will see. There are several examples of the HIWTYL instinct playing out in The Office. The earnest Andy puts together a small business seminar to generate new sales leads. Initially, the other sales people refuse to participate, dismissing it as yet another clueless move. But when the seminar idea actually starts to work, they swoop back in, sycophantically eager to partake in the success. Ryan attempts to get Pam to clean the dirty microwave, but when she resists and challenges him about not doing it himself, he feigns extreme incompetence. Pam engineers a sales role for herself with Michael’s help, but when she cannot cut it, she takes advantage of ambiguities and made-up communication breakdowns to invent an Office Manager sinecure for herself. When the sales force is moved to a compensation structure without caps on commissions, tensions rise as the salespeople, newly energized by a competitive spirit, alienate the support staff. To restore good relations, they decide to share a fair percentage of their new rewards. But at the last minute, they realize that the support staff can be bought off much more cheaply, with flattery and gestures like throwing a party. When the company is nearing bankruptcy, Oscar comes up with a grim and realistic long-shot salvage plan. He is perfectly willing to try indirect influence and have somebody else champion it (allowing him to claim paternity in the unlikely case that it works). But when Michael tries to get him to personally propose it to the executives, he smartly worms his way out: he has no interest in being made visibly accountable for a high-risk plan. But such occasional HIWTYL improvisations are far too unpredictable and unsystematic for Sociopath tastes. For them, HIWTYL is not about hacking reward/penalty structures after the fact. It is about proactively engineering systems and processes that reliably, predictably and stealthily generate HIWTYL outcomes. In other words, they look for ways to systematically claim paternity for successes, and orphan failures. To understand how Sociopaths handle HIWTYL engineering, consider the Golden Ticket example. It was a random idea that initially seemed good, then seemed to prove out bad, and then unexpectedly ended up as a win. Such are the uncertainties of life. How would you attempt to bank such a success in predictable ways? First you would cut a deal for a performance-linked bonus for a successful marketing campaign (but no penalty for failure of course). Next, you would set up a committee and charter it to collect, vet and recommend ideas, perhaps with a promise of some nominal rewards, such as gift certificates, for successful ideas. You would then drop hints and suggestions to create ideas, like the Golden Ticket scheme, that you personally favor. And finally you would create the appropriate level of urgency in the work of the committee to achieve the risk-levels you want in the ideas produced. If it works, you praise everybody generously, hand out a few gift certificates, keep your bonus to yourself, and move on. If it fails, you blame the people in charge of the work for failing to consider an “obvious” (with 20/20 hindsight) issue. The chair of such a committee would likely be Clueless, his appointment being a false honor — a case of being set up take a fall. The nominally accountable Clueless chair would be charged with incompetence. The Losers would be blamed for poor esprit de corps — “we need to improve employee engagement around here” — (a case of blaming Gemeinschaft). This sort of three-way distribution of blame is designed to discount the full magnitude of all-around culpability. The sum of the three kinds of blame assigned is not equal to the whole. This simple example leads to a few interesting questions. How does this sort of thing operate at larger scales and longer time-horizons? What happens to the deficit, the portion of blame not assigned to anyone? Why do we want to fudge the books at all? Why not try to account for all the credit or blame as fairly as possible? We will tackle the first two questions in this part, and save the Why for the finale. The basic mechanism by which Sociopaths transfer blame to the Clueless, while reducing the overall severity of the penalty, is an application of Hanlon’s Razor: never attribute to malice what can be adequately explained by stupidity. Because Hanlon’s Razor is often true, it is a believable dodge even when it is not. Coupled with another uniquely human trait, the tendency to link penalties to intentions rather than consequences (eg. first-degree murder vs. vehicular manslaughter), Hanlon’s razor can be used to manufacture predictable HIWTYL outcomes out of fundamentally unpredictable situations. How? By shifting blame from a locus where it would be attributed to malice, to one where it can plausibly be attributed to incompetence, the severity of penalties incurred is lowered. Hanlon’s razor is double-edged, and Sociopaths use it to feign incompetence themselves or to charge others with incompetence, as necessary. The simplest example is Ryan feigning incompetence in the microwave-cleaning episode: Ryan wanting the communal microwave cleaned is a defensible end, but openly treating Pam as a menial would be unacceptable in our time. So he uses his own incompetence, both to disguise the means he is trying to use (getting Pam to do it), and to insure against failure. Wallace: That’s right, and I was wondering if I could get you to do some of the fieldwork that would normally go to the supervisor. There’s an area from Carbondale to Marshbrook where we have never done any business. There’s a small company there, Prince Paper. I can’t get a report on it because it is not a public company. But we’ve been talking about going after their market, so I was hoping you could do some fact-finding for me… I’ll fax over some of the things we’re looking for. On the surface, this is a routine request to do some above-board competitive analysis. But by dangling the carrot of a better job and carefully refraining from specifying how the end is to be achieved (using abstractions like “fact-finding” and “fieldwork”), Wallace knows he can get Michael to do what he really wants done: industrial espionage. He engineers execution of his real intention (obtaining an unfair and illegal advantage over Prince Paper) using a predictable “failure” pattern in the execution of his declared intention (honest competition). He knows Michael can be relied on to try foul means, while letting him pretend that he only expected fair means to be used. This is delegation with a built-in insurance policy. If the plan succeeds (as it does), Wallace can do exactly what he wants: drive Prince Paper out of business. If it had failed, and the industrial espionage had come to light, Michael and Dwight would have been held responsible for incompetent and overzealous execution, and a petty criminal act. Had Wallace been more explicit, he would be been vulnerable to the more serious charge of orchestrating systematic anti-competitive practices. As a bonus, Wallace keeps his hands clean for potential future interactions with Prince Paper (such as a White Knight buyout or grabbing newly unemployed talent at fire-sale prices). As the bloodied instrument, Michael has fewer chances of future positive interactions with the Prince Paper folks. In a later episode, when he is looking for a job, we see that his list of prospects has Prince Paper on it. When he calls, he gets an out-of-business message. Even if David Wallace hadn’t driven them out of business, Michael could not have landed a job there, after what he visibly did to them. Sadly for Michael, the world is small and life is long. A more complex example, involving both kinds of Hanlon Dodge at multiple levels, is the Dunder-Mifflin shareholder meeting, with the company on the brink of bankruptcy. The angry shareholders are in a mood to indict the executives for maliciously running the company into the ground and lining their own pockets. To believably shift the blame to incompetence, the executives bring Michael to the shareholder meeting and hold him up as an example of success. By crediting him with success, the executives hope to provide evidence of best-faith executive management, minimize the perception of complete failure, and lay the remaining blame for failure at the door of market uncertainties and the incompetence of other managers (this is one of the more subtle ways to use false honors; a more common use is as a preparatory step for a basic scapegoating). The effort blows up in their faces because it works too well, and the train-wreck that ensues is interesting at multiple levels. In the private caucus that follows, the angry executives turn on Michael. Wallace: What are we supposed to tell them now, you’ve really dug us quite a hole? Michael: Well… we tell ’em the plan. Wallace: There is no plan. Belatedly Michael understands his predicament and tries to rope in Oscar and his long-shot salvage plan. Oscar however, has no intention of being on the wrong side of the HIWTYL bargain. He refuses to publicly stand behind the plan he had privately proposed to Michael earlier. He decamps after making some polite noises, leaving Michael stranded. Board-member: He’s the best manager we have? Where’s the off button on this moron? In summary, seasoned Sociopaths maintain a permanent facade of strategic incompetence and ignorance in key areas, rather than just making up situational incompetence arguments. This is coupled with indirection and abstraction in things asked of reports. The result is HIWTYL judo. How do we know this is not just a case of giving reports autonomy and discretion in how to act? Simple: when you genuinely want to give reports responsibilities that help them grow, you give them autonomy where they are strong. When you want to use them in engineered “failures” that give you the outcomes you want, you give them autonomy in areas where they are weak. If they can be relied upon to break laws, turn to violence, exhibit useful overzealousness or cut corners, those are the areas where you allow them discretion. Together, these two behaviors allow Sociopaths to exploit the full potential of Hanlon’s Razor. On the one hand, they can avoid doing unpleasant things themselves. On the other hand, they can achieve indefensible private intentions while maintaining plausible deniability. The Clueless and Losers debate whether or not ends justify the means. Sociopaths use whatever is justifiable to cover up whatever they want to get done. The result is a theater of justification. The theater of justification was largely superficial in the early days of corporatism. Behind the scenes, bribery, murder, intimidation and even general massacres (such as the machine-gunning of strikers) were openly deliberated. Today, the theater extends deep within the organization itself, and evidence implicating Sociopaths is not even allowed to come into existence in most cases. Losers are far too smart to fall for Hanlon Dodge maneuvers as individuals. You need to work them in groups to get them behaving in sufficiently stupid ways. You also need to hook their own HIWTYL instincts, introducing a certain degree of complicity. We will see the significance of this complicity later. For now, let’s just see how it’s done. When you work Gemeinschaft — the matrix of personal connections and trust relationships that binds Loser groups together — there is really only one basic tactic: divide-and-conquer. The key to successful divide-and-conquer moves lies in recognizing and exploiting two features of Loser groups. Within the group, such dynamics merely reinforce status illegibility, as we saw last time. There is a never-ending sequence of little skirmishes within sub-groups, where people gain or lose status in specific situations. These situations usually involve a sub-quorum audience, which contributes to the status illegibility (since absent members of the group will not update their status assessments accurately). Without external interference, these skirmishes work to keep the group at the edge of stability. They fault lines remain in a fluid state, widening and narrowing as the group saga evolves. Attractive and repulsive forces balance to keep the group at a marginally stable level of intimacy. Until Sociopaths step in to exploit the precarious equilibrium. Loser group dynamics offer a natural exploit: almost anyone can be made to ally with, or turn against, anybody else, with no need to manufacture reasons. Almost any sub-group can be played off against any other sub-group, since there are no absolute loyalties. The presence of myriad fault-lines within a Loser group presents a canvas for divide-and-conquer artistry. A rather clumsy example is Robert California, the new CEO in Season 8, leaving a mysterious two-column list of employee names lying around to be found. After letting the group work itself up into a state of general anxiety for a while, he reveals that the list is a winners/losers list, but that it is not set in stone, and that anyone can work themselves into or out of the winner column. That sort of direct attack on Loser group cohesion is unlikely in real life, but illustrates the basic idea clearly. A more realistic example is the sales-vs.-the-rest episode. In this case, the Socipaths spark a behavior change using a new incentive structure for the salespeople. The purpose is not merely to drive motivation at the individual level, but to drive collusion and schisms at the group level (any incentive preferentially offered to one sub-group will do this). The incentive scheme itself is a HIWTYL mechanism from the point of view of the Sociopaths. If the salespeople had virtuously come together in solidarity with the support staff and shared their increased commissions as they’d originally planned, the Sociopaths would have still gotten improved performance overall at bargain prices, compared to costlier all-around incentives. Of course, Losers being themselves susceptible to HIWTYLing, the Sociopaths could have confidently predicted what actually happened: collusion within the sales subgroup to screw over the support subgroup, with a nascent fault-line hardening into a true schism. In this case, the schism could have been further exploited for benefits beyond the nominal aims of the incentive. The support subgroup could have been laid off and their jobs outsourced for example (after a preliminary re-org and possibly a relocation, to widen and formalize the new schism). The second key feature of Loser groups is that they naturally apportion credit for successes and failures in ways that don’t balance the books. To work the Clueless, you need a Hanlon Dodge to get to reduced charges. With the Losers, something similar happens naturally. Here’s why: Losers will accept blame, but only in inverse proportion to their self-perceived status. Due to the murkiness of collective responsibility, and the effect of status illegibility, self-perceived status is the only available basis for dividing up credit or blame. If everybody believes they are above average (with everybody else supporting that delusion, as we saw last time), they will assign more of the blame to others and less to themselves, and convince themselves that their partitioning of blame is fair. If each person’s culpability for a failure is taken at their own valuation, you will have a net deficit in the total accounted-for blame. Conversely, with a success, the sum of self-perceived credit attributions is greater than the credit actually available to go around. Loser group successes are effectively inflated, and blame discounted. So as Loser groups accumulate a history, internal valuations of earned credit are steadily inflated, and assessments of culpability run a deficit. A successful group systematically overvalues its capabilities and develops a blindness to its weaknesses. In the abstract, divide-and-conquer tactics are about forcing a real-world valuation event, during which such real deficits and fictitious surpluses are exposed, and paid for with lost social capital: schisms. The engineered schisms increase status legibility along the fault-line, and the group breaks apart, with the pieces regaining stability through illegibility. In the sales-vs.-the-rest case, the real-money skirmish reveals to both sides that the salespeople have higher status. Such social capital destruction is always much easier than social capital creation (though not portrayed in The Office, this is usually done by subjecting a group to a forged-by-shared-combat experience). In summary, Sociopaths use unbalanced incentives to harden a fault-line into a schism, relying on natural intra-group tensions and fuzzy accounting to do the job. Take note of a couple of aspects of Loser psychology as revealed by their behavior under such manipulation. Losers have a genuine sense of honor. The want to accept fair blame for failures and fair credit for successes. Their HIWTYL instincts are buried under a layer of denial. Rather than make unfair claims directly, they make their unfair claims via deluded assessments of their own in-group status. They also have significant empathy for each other, and a natural solidarity, so they don’t like to pull naked HIWTYL maneuvers on others. When they do pull such maneuvers, they prefer to victimize faceless groups or institutions rather than individuals. When they do victimize individuals, they try to dehumanize their victims first (simultaneously lowering the victim’s status to balance the books, and reducing their own empathy so they don’t feel bad). Often, this is achieved through anger and contempt, allowing a “s/he deserves it” rationalization. It’s a case of dogs giving each other bad names, and hanging themselves. At the center of the Gesellschaft drama is the institution itself, with its organization charts, line and staff hierarchies, defined systems and processes, appeal mechanisms, formal roles and responsibilities, and formal statements of accountability. In other words, we’re talking paperwork. One type of paperwork in particular: forms. You’ve probably heard a piece of cynical wisdom: the purpose of a form is not to serve the person who submits it, but to protect the person who processes it. Beneath that piece of wisdom is a whole can of worms. Let’s take a look at how it works, in the episode where Holly, Michael’s Clueless love interest within the HR staff hierarchy, administers an ethics seminar to the employees. Holly, marginally less Clueless than Michael, tries to merely go through the motions, but Michael convinces her to take it more seriously. So naturally, they manage to screw up the due process theater and accidentally uncover an actual ethics violation: Meredith trading sexual favors for supplier discounts. Out of a misguided sense of sincerity, she reports the discovery, and is promptly summoned to a conference call by an HR staff Sociopath, Kendall, along with Michael. Holly: Yes, that came out during the ethics seminar. Kendall [ignoring Michael’s remark]: Well, I’m not sure these circumstances warrant any action. Holly: Oh, I think it is pretty clear that it was unethical. Kendall: Well, from what I can gather it seems like a gray area…Look, to be honest the company is getting a discount at a tough time in our balance sheet and I don’t know that the right thing to do for the company is to turn our noses up at that. Holly: Umm, Kendall, I understand that the discount is good for the company but I’m just not happy about the way we are getting it. Kendall: I thought it was clear with you, Holly. Your task was to get signatures from the employees showing that they completed the training. Kendall: Every other branch has managed to get this to us, so if it’s not something you can handle, then that’s a different discussion. Holly: No. I can do it. There are several features to observe here. First, as Holly finally gets at the end of the conversation, she must not exhibit any autonomy in executing the process. There is no room for exercising her own judgment or discretion. There is no autocrat in sight, but her orders are autocratic. She is not being managed by gentle suggestion: she has been issued direct orders. When she deviates, she is reined in with a thinly veiled threat. Second, there is a clear legalist distinction between on-the-record and off-the-record parts of the process, and an expectation that the latter will hew to the needs of the former: the formal record must be above reproach, and equivocation must be practiced in everything said before untrusted people (which, for Sociopaths, is everybody else). Even Michael is aware of the on-the-record/off-the-record distinction, though he doesn’t understand how it works. Kendall’s caution is evident even under these extreme circumstances: his line “I’m not sure these circumstances warrant any action” is a cue for Michael and Holly to get the script back on track. Only when that cue fails does he make the one potentially indefensible remark, with the “to be honest…” preface. Why, in our era of soft, empathetic, positive-psychology management-by-objectives, do we still have people like Holly, bound by rigid rules? What happened to employee empowerment? How are such direct “orders” successfully issued without inciting rebellion and mutiny? In the disembodied voice of Kendall, we’ve encountered the shadowy background part of the organization: the staff hierarchy. Otherwise known as the bureaucracy. The risk-management work of an organization can be divided into two parts: the unpredictable part that is the responsibility of the line hierarchy, and the predictable, repetitive part that is the responsibility of the staff hierarchy. The predictability allows Sociopaths to automate much of the HIWTYL risk-management they need. Instead of having to expend effort executing Hanlon Dodge maneuvers, putting on justification theaters or engineering divide-and-conquer situations, they program the organization to act in those ways by installing bureaucracy-ware. Bureaucracies are structures designed to do certain things very efficiently and competently: those that are by default in the best interests of the Sociopaths. They are also designed to do certain things incompetently: those expensive things that the organization is expected to do, but would cut into Sociopath profits if actually done right. And finally, they are designed to obstruct, delay and generally kill things that might hurt the interests of the Sociopaths. All three functions are evident in the Kendall-Holly-Michael episode. Desirable things are enabled and expedited (the advantageous discount). Expensive and expected functions are paid lip service (ethics). And things that might actually hurt (the “employee immunity” idea from Michael) are killed. The employee immunity idea is actually quite logical (and is employed in the criminal justice system for example), but is not in the interests of Sociopaths in this case. Sociopaths design the system this way because they are only interested in building an organization that lasts long enough to extract the easy value from whatever market opportunity motivated its formation. Expensive investments that will not pay off before the organization hits diminishing returns are not made (it is revealing that the longest-lived businesses are family-owned — Sociopaths have an incentive to think long term if they intend to pass the business on to their progeny). The bureaucracy achieves its autocratic moral authority via an abstraction called the rule of law. Its emergent personality is Clueless by design. It is designed to fail in ways that achieve unspoken Sociopath intentions, while allowing them to claim the nobler explicit intentions enshrined in the law. But this only works if the members of the hierarchy actually play along. If they display any sign of autonomy, a precedent is set: human discretion can over-ride the rule of law. This puts the human stewards above the law, and makes them culpable when their decisions go wrong. “I was just doing my job” or “I don’t make the rules” is not a defense if you have a history of deciding what your job actually is, and selectively breaking or bending rules. So what happens when the rules dictate clearly inappropriate responses to specific situations? The on-paper solution is the right to appeal decisions or trigger exceptions. This solution is designed to work in exactly one case, and fail in all others. The cases that get through in a timely manner are those that would benefits the Sociopaths. For those that don’t, the specific case is generally killed by the delay inherent in a converging appeals bottleneck. Future instances are handled by adding complicated exception clauses to the laws in the “designed to fail” ways we saw before. As a friend once remarked, tax law is complex for a reason: its primary purpose is to catalyze the growth of complicated exception-handling on top of an apparently simple percentage calculation. As an added benefit, this means that over time, the “law” gets increasingly burdened with byzantine complexity. It becomes progressively more error-prone and arbitrary. As it grows, the scheme evolves beyond the comprehension of even the individuals within it, making it progressively easier to get the members to play along. An enlightened bureaucrat might conceivably challenge a relatively simple form and attempt to exercise cautious amounts of discretion. A bureaucrat in charge of a truly byzantine process will likely be too confused and intimidated to challenge it (especially in modern IT-enabled bureaucracies, that are literally automated decision-rules systems run on computers, with only a few bewildered humans babysitting the beast). There are only three ways to get a bureaucracy to do anything it wasn’t designed to do: by stealth, with secret and deniable support from allies in the staff hierarchy; by getting air-cover from a sufficiently high-up Sociopath who can play poker with whichever oversubscribed Sociopath is in charge of exception-handling for the specific process (i.e., jumping the appeals queue and calling in favors to ensure the required ruling); and through corruption and bribery. Returning to our overall theme of HIWTYL blame management, how does this scheme of things mitigate blame and shift it to safer places? You simply blame the Clueless-by-design “system.” You shake your head at its irrationality and slowness. You marvel at how it actually grows more byzantine and complex as it ages. You go from blaming the insiders for malicious pettiness in a young bureaucracy, to blaming them for being dumb cogs in mature ones. You periodically attempt to “reform” it through means that only ensure it gets worse (adding complexity). Controlling the beast are the staff Sociopaths at the top, who program it, the Clueless petty bureaucrats or priests in the middle, and the staff Losers at the bottom. Staff losers are even more checked out and disengaged than the line Losers, since their entire function is to serve in a non-productive, passive-aggressive role on the one hand, and a menial, procedural role in aid of Sociopath intentions on the other. It is not a role that attracts people looking for even a little meaning in life. Overall though, the staff hierarchy is subservient to the line hierarchy. Staff Sociopaths are lazier than line Sociopaths — they seek rents rather than the higher returns of active Sociopathy. Historically, this laziness was deliberately manufactured by line Sociopaths: emperors working through eunuchs, slave-soldiers, celibate priesthoods, and other asexual and estranged-from-family types who could be relied on not to look out for their kin (historically, the biggest challenge to Sociopaths has been kinship loyalties in the relatively autonomous line organizations, so they have always sought to stamp it out in the staff organizations that they control more directly). The vaguely asexual and androgynous character of Gabe — a staff enforcer for the CEO — is not an accident. We are now done with the three-way partitioning and mitigation of blame. Let’s take stock. Putting the whole picture together, you have a story of risk-management with systematic HIWTYLing of the rewards and penalties earned. Blame is partitioned among the individual Clueless (via Hanlon Dodges), Loser Culture (Gemeinschaft via divide-and-conquer) and the designed-to-fail bureaucracy (Gesellschaft). The degree of complicity in this state of affairs varies: the Sociopaths are highly complicit, but are able to deny almost all of the complicity, theirs is the best HIWTYL bargain. The Losers are trapped into complicity in the process of divide-and-conquer moves, and are not in a position to completely deny their complicity, except to themselves. As we will see next time, they’ve been hustled in this specific way for a reason. The Clueless are the least complicit in terms of actual intentions, and are put within systems that are designed to protect them using their own cluelessness. They do try their own HIWTYL behaviors, but generally fail. Others need to do their HIWTYLing for them, for their own good. While some get better HIWTYL deals than others, the blame management scheme overall is designed to be fundamentally leaky and non-zero-sum, with most of the blame draining away as unaccounted-for sins, turning into invisible organizational dark matter. The organization itself gradually turning into an incomprehensible, byzantine and increasingly error-prone maze, as it pretends to evolve and self-correct. Systems and processes clogged with delayed exceptions, awaiting the attention of the Sociopaths at the top, who handle them with one eye on the residual value remaining to be harvested, trading expedited favorable decisions with other Sociopaths who need their exceptions to jump the queue. While the value being realized is in an increasing-returns phase, the Sociopaths conscientiously handle exceptions to make the extraction more efficient. As the value declines, they gradually start cashing out, let exceptions pile up, and allow the organization to die. And so the organization starts to die for our sins. Invisible, unaccounted-for sins accumulating as dark matter somewhere. And where there is an accumulated burden of our sins to be borne, we should expect to find a Messiah figure. Which brings us to Toby, part rent-seeking staff Sociopath, part Incompetent Messiah and redeemer, the only son of a loving God, sent to protect the Clueless, forgive the penitent Losers and punish the unrepentant ones. Of course, since the Messiah will have been sent to us by Chancellor Entropy, he must suffer torture and agonies, but fail to actually redeem us. And we will finally get to the most basic question of all: what does it feel like to be a Sociopath? What is it like to wait for Godot? What are we to make of the fates of Ryan, Jan and David Wallace (increasing degrees of madness). To explain their stories, we will need to go beyond the loving God of the Losers and Clueless. We will need to deal with an entire pantheon of gods: angry ones, malicious ones, apathetic ones, and ones that look suspiciously like devils. We will also explain what actually happens to the organizational dark matter when the organization dies. The booga-booga will end, I promise. I just need a little more time so I can also produce and inflict an ebook on you while I still have your attention. It will be packed with some worthless ebook-exclusive extra features. Wow! Deep analysis, the interesting question is to whom could you *sell* this expertise? 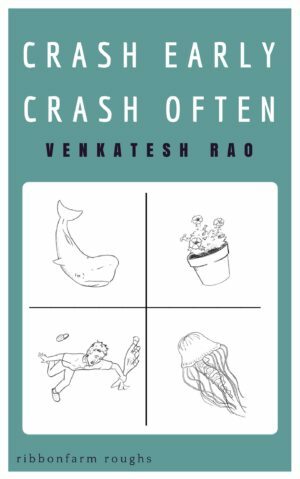 So you’re saying you didn’t buy the Tao of Venkatesh, aka Tempo? I think you’re detailing the systemic problems of all of public life here – from governments to corporations on down. The systemic programming you attribute to sociopaths I’ve tended to attribute to the emergent properties of fear and violence (creating opportunities for exploitation that create and attract sociopaths), but your case is compelling. But I think this points us to seeing exactly how the risk-externalization of corporations is fueled, why government is interested in enabling such a scheme, and why democracy forms the perfect backdrop for this kind of sociopathic exploitation writ large. Yes. It is not a difficult extrapolation. And there’s fictional sources like The Office covering the same dynamics in other parts of our world. Sadly, they’re not all as funny. Fukuyama’s “Origins of Political Order” (which informed this installment quite a bit) actually tries to construct such a big-picture extrapolation, but is somewhat hobbled by its own ideological commitments, and inclined to look at the positive aspects of the Hobbes-to-#occupywallstreet journey. This series has been great. I’m very much looking forward to the next part. A lot of this post strongly reminded me of Christ’s teachings in the Bible decrying the hypocrisy of the ruling class, the Pharisees. Christ is saying, essentially, that HIWTYL tricks can only last so long. All the invisible organizational dark matter will eventually be brought into the light and there’ll be a true reckoning made by the ultimate judge. Great post as always. Seems like I need to read Fukuyama’s “Origins of Political Order”. I read his “The End of History and the Last Man” book a month or so ago and absolutely loved it. I am not very knowledgeable about the Bible, but I do plan to make use of the basic “Christ died for our sins” idea as a metaphor in the conclusion. I’d generalize your point and assert that every religion is basically a viewpoint on how to balance HIWTYL books. I’ll cover that idea next time. The correct spelling is “Gemeinschaft” and “Gesellschaft”. Otherwise an outstanding article. Maybe it’s picky but, german nouns are spelled starting with a capital letter. Also “Gesellschaft” is also spelled incorrectly in Part III: The Curse of Development. Now that’s where it ends what I have to add to the discussion. There’s no more right now. Reading your stuff for me is a challange. I mostly come to the conclusion: “yup I can agree with that”. And at the end I get to believe I have somehow wrapped my mind around the contents. And the I reread it a week later or so, and I think “boy, how did I come to that believe? I can’t really grasp what this guy is talking about”. 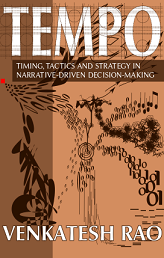 Same with the Tempo book. Big joy to read for me but still way to go to actually climb that mountain on a slow-paced re-read. Maybe partly this is due to your writing style that’s somewhat .. don’t know how to express it (I’m not a native english speaker) .. to me it seems something in the line of “syntactically easy but semantically hard”. Which tricks you into believing you got it while actually you don’t. But then.. maybe that’s how it’s supposed to be when you follow a deep thinking blogger (with a bag of rhetoric trickery). Anyways .. Kudos Mr. Venkatesh. I don’t give up – yet. Fixed both, thanks. Damn these Germans. That’s always the case when exploring beyond the known boundaries of any subject. Partly because, it requires that you invent a new set of vocabulary(the reason why Glossary is a important part in stimulating* books) And Venkatesh Rao does that in the domain of Decision systems in Management. I notice a darker view of sociopaths in this post than in previous ones. No hint of the concept in the original post that these are the people making the organisation work in spite of itself. I’m not sure that that darkness is actually helpful; it would be much more useful to show the tension between using this kind of hedging (with it’s feedback-fogging and inefficiency-crystallising tendencies), and actually allowing for an upside that you can profit from. Obviously taking risks then externalising the downsides into the body of the organisation is basically what incorporation is about, but the other side to it is common property and common productive endeavour. The prisoner’s dilemma, in short. The more sociopaths focus on externalising risk (covering their arse), the less they will handle exceptions in a canny way, look ahead for icebergs, or anything else that will lower global risk and allow them to keep pumping in their own (or maybe even allow them to increase profit). Yes, it’s definitely gotten darker. I may be taking my cue from J. K. Rowling’s last 2 books. I do believe that there is a common upside property as well. I just think it doesn’t actually live within the body of the corporation. It leaks out into the general economy and lives there, both formally (via IP going into public domain) and via people moving between organizations. This is one reason old corporations are in such a panic about retiring Boomers… a lot of the common property/value is actually held inside the heads for the collective good, because there is no trustworthy collective externalized store for it. Aerospace engineering is a very good example field. With fewer and fewer aircraft design projects, the knowledge of how to design and build things like the F-22 may well erode a lot as the Boomers retire. I cut myself off when talking about common productive endeavour; it is the prisoner’s dilemma to sociopaths, but of course, that’s not all it is! It’s other elements probably appear more obviously in different metaphors, like machines or brains. There’s a paradox there, that these skills or ideas are simultaneously transferable/copyable between people (ie. potentially “for everyone”) and dependent on specialisation: Beyond personal strengths, which is only a matter of efficiency, these skills only require a set of complimentary roles if they are to manifest; they need people to take on the other sets of skills to play the other roles. So paraphrasing what you say, the project itself becomes a way of preserving the receptacle of the skills. Should we have re-enactment villages for aerospace engineers, as we do for Saxon era skills? Probably not, but the alternative is very tricky to work out; I once had someone try to train me with great difficulty, because his skills depended on a certain set of relationships; he was used to just trying stuff out in response to a problem, without having to explain anything. The only way he could work out to do it was to go a little Heglian, with him treating me as an extension of his body. Equally, the problem of moving on to a new project seems to be in finding determinate transformations between the two roles, ways to map your old experience onto the new situation. And quite a lot of the time some elements of those old skills get left on the side. I’m not sure what an externalised store of that kind of personal knowledge would be, aside from a set of overlapping masks and instructions for playing them! Or maybe a frustrated coaching service. Hmm talking too stridently here. It seems reasonable to say that there is a basic level that someone has to be able to perform a skill at, below which it is not in any way transferable to someone more suited to it. And even if you distinguish innate receptiveness to a skill from learned experience with it, and find a way to transfer that experience, some people will not have the right susceptibility to ever achieve that basic level. So there might be a limit to which you could teach someone “aircraft design” kata (or equivalent toy-problems) and hope for them to be able to develop enough skill from that to be able to transfer it, or support other people in sustaining associated skills. Thank you for this very helpful installment. It has given me some great insight into the dynamics of my own organization. We have had three re-orgs in the past five years, which I now realize have been Sociopathically engineered bureaucratic manipulations of the Gesellschaft. Actually, this emphasis on the mens rea rather than the actus reus in the American criminal justice system is a product of the 20th century. Prior to that, particularly in frontier regions with a dearth of law enforcement, consequences drove penology. The distinction between 1st degree murder and death by negligently operated stage coach would have been disolved by the hangman’s noose in either case. Indeed, in England during the period when the common law was coming into fullest flower, most felony offenses — but certainly robbery, assault and grand theft — were capital offenses. This was mitigated somewhat by transportation, i.e. the practice of shipping criminals off to colonies as pioneering inhabitants (early Anglo-Australia is perhaps the best known example). And even earlier, during the Anglo-Saxon era, most crimes were punished by exacting weregild (a money fine, so-called blood money) based on the consequences and social status of the victim. Now, of course, with the predominance of psychology as the frame for understanding human behavior and the self-esteem oriented pedagogy of our public schools, it is no wonder that the criminal justice system is intention oriented. With the added pressure of strained public finances, the pendulum has tilted decidedly toward rehabilitation rather than incarceration because policy wonks believe overall social costs will be lower. I am not as sanguine. That’s fascinating. I was not aware of the history of the intention-based legal system. I still suspect there is a fundamental piece of human psychology which links punitive behaviors to perceived intentions rather than consequences (hence the commonly used, and often effective “it was an accident!” or “he’s just a child” defense in ordinary affairs, which often leads to forgiveness). In religious law too, I think historically the absence/presence of penitence has dictated consequences. If I recall correctly, it was Hayek who proposed the idea that codified law emerges from some sort of natural law, which in turn emerges from natural behavioral predispositions. I just finished reading Larry Lessig’s “Republic, Lost” —coming from that to this makes disturbingly clear the reason that Congress is stalled and reform is impossible: the efforts of Sociopaths to maintain their power. In this case, it could be claimed that the legislative branch is actually full either of Clueless or staff Sociopaths, at the command of moneyed line Sociopaths. Intriguing. Branch merger episode at the end when Stamford and Scranton branches are bonding over Michael’s insanity. In fact, I thought that was a big part of the joke. The fact that Michael’s incompetence is exactly what makes his branch so productive. Why do you quote Nietzsche? What have you read by Nietzsche? What has Nietzsche ever written that could even remotely be paraphrased as “only the flesh is real” ?!? Why don’t you just quote Christopher Hitchens or Bill Maher or Richard Dawkins? You think Nietzsche wrote the 19th century version of “Religulous” or something? Do you know he disdained the materialists of his day? Are you aware of his influences like Shopenhauer, Goethe and Ralph Waldo Emerson? What is your understanding of his concept of “will to power” “self overcoming” etc? You think he merely means biological determinism? You understand he wasn’t a nihilist right? That he was an anti-nihilist? That that was his whole point that Western Civilization was plunging into Nihilism and so the only thing that motivated him was finding away out of that abyss? Seriously dude did you the only read the Spark notes? “oh, well We are all screwed anyway” is just so totally not Nietzsche’s point, from what I have read, anyway. I’ll let this ad-hominem-ridden comment go this once. If it’s ad-hominem, it’s pretty gentle. From my perspective, however, you rock. A very interesting series, thanks for the great read. Its been a while since you posted part V; are you still planning on writing part VI? Agreed. I find the cringe-effect too harsh to want to watch The Office, but the analysis is instantly understandable. You’ve got an excellent series going here; please finish it. Love this series. I wonder what sort of archetypes emerge in other human endeavors outside of the for profit capitalist corporation. It does feel like you’ve nailed it. As a clueless loser with a strong desire to remain ethical – I marvel at our collective ant-like capacity to organize around miniscule objectives within the larger swarming hive – creating exception driven heaps of ever burgeoning complexity for ourselves — and the next poor schmuck to be hired into the parade/maze of cluelessness while subsisting on crumbs and simultaneously fattening up the Queen/Ceo like a modern day pharoah. Sometimes I stop and wonder why humor all the little ants. It almost seems like charity. Is there some secret pact theyve signed with the govt to provide jobs for people. Most jobs seem pointless and absurd and could easily be outsourced or automated out of existence. Is it just some social qwerty phenomenon were all mindlessly following because thats just how they do it cargo cult style? Bah. My tablet would not let me edit that rambling response so it was either submit it ir lose it. Anyway keep up the societal debugging -it is mind blowing.